The start point of the Lemosho Route is particularly inaccessible during the wet season and climbers should be prepared to walk the final 2-5 kilometres of the road following heavy rains. The journey time to reach the start point is quite long and joined to the possibility of not reaching the end of the road by vehicle head torches may well be needed to reach Forest Camp on day 1. On day two the route ascends towards the eastern side of the Shira Ridge, the third summit of Kilimanjaro, before bending left to round the north side of the Shira Ridge and attain the Shira Plateau, pictured at the bottom of this page. Want to See Photos of our Trekkers on the TK Lemosho Route? We keep an archive of all our climbs. See our TK Lemosho Route images. 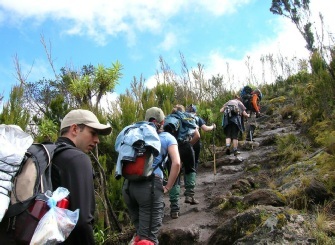 Thinking of trekking the Machame Route?